The whole island of Mindanao has been presented to the general public by the ‘tri-media’, particularly the irresponsible journalists, as a dangerous place to be in. With this sweeping statement, the beautiful side of Mindanao has been blocked from the eyes of the public due to fear and anxious feeling of being kidnapped or killed. With this blog, I hope I can help turn things right by revealing the true face of the land feared by many. I also hope that everyone who reads this blog will agree with me. First stop, the province of Surigao del Sur. 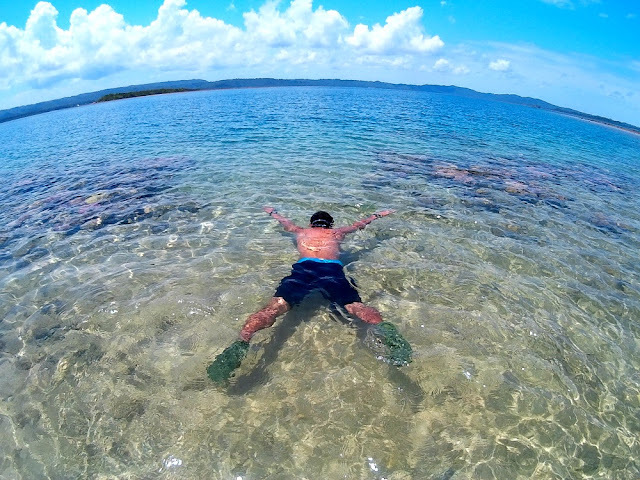 This huge province in Mindanao is a sleeping giant when it comes to tourism. I have come and have worked in this place for almost two years now and it has never stopped surprising me with beautiful potential tourist destinations. 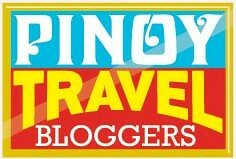 The first three sites that amazed me were Tinuy-an Falls, Hinatuan’s Enchanted River and Britania Group of Islands . These magnificent destinations had been previously featured in this blog. 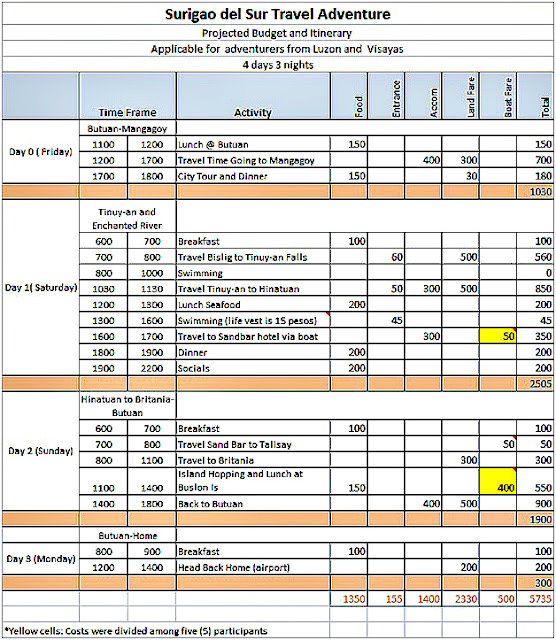 To give way to those who wished to experience the Tri-Aqua Mindanao Adventure, I made a list of travel tips that include itinerary and a projected individual budget. Note : I assumed that visitors are coming from Cebu or from Manila. So the cost projected in my calculation is a little higher compared to locals’ expense since accommodation is required for a 4-day 3-night stay. And of course, those who are coming from Mindanao can expect that your budget will be reduced by half especially if you are coming from the nearby town or city. The costs are also subject to change, so I suggest putting an extra margin on your budget would be a smart move. Direct Trip- From Bancasi airport you can hire a taxi, the price range is from Php200-300 going to the bus terminal or you can go wit the cheaper way by finding the Multicab with a sign 'ROUTE 4' waiting in-front of the airport and it will you lead directly to Butuan Central Bus Terminal. Each passenger has to pay Php20.00. Just bear with the inconvenience of choosing the latter. At the terminal, look for the Bachelor bus heading directly to Mangagoy, fare is approximately Php 300.00. Travel time is estimated 5 hours. Cutting Trip- If the bus going to Mangagoy has just left, take the bus going to Davao; inform the bus conductor that you shall alight in San Franz ( San Francisco, Agusan del Sur). The fare is Php110 for non-aircon bus ; travel time is 2 hours. From San Franz, you have the option of waiting for a bus bound for Mangagoy or take the van for the same route. Fare is Php 200.00 , travel time is 3 hours. You will know that you are near the City terminal of Mangagoy when you see the vast city boulevard with murky brown seashore. From the bus terminal, take a tricycle to pension house /lodge of your choice. In my case, I tried Sheila’s Pension House along Espiritu Street for Php 700 air-conditioned room good for 3 occupants. At night, you can take a tour in the city by walking or taking a tricycle at Php8.00 per ride. Commercial food chains are available like Jollibee or if you are in a tight budget, 'carenderias' are overwhelming in numbers. You can ask the locals if habal habal passes by your street, if not, take a tricycle and ask the driver to take you to the terminal of the Habal habal. From there, negotiate with the driver for a Tinuy-an Waterfalls and Hinatuan River transfer service. In my experience, we hired two habal- habals for Php 1000.00 each (sharing among 4 adventurers). After you get tired of Tinuy-an, get ready for a 2-hour ride to Hinatuan. Reaching Brgy. Talisay, the road is half finished, so better prepare a handkerchief or small towel to cover your face against the dust. Brgy.Talisay would be the end of service for your habal habal so politely give your thanks to your driver and his ‘PF’. The entrance to the gate is Php30.00 and additional Php100 -300 for the table of your choice. You don’t have to worry about the food; a small wet market is available outside the gate. You can ask the vendors to cook it for you for a minimal fee of course. Rice and beverages are also available. Plastic bags are not allowed. So don’t get pissed off when the vendor refused to sell you a plastic bag for your wet clothes because plastic bags are prohibited (barangay ordinance) in the whole vicinity of Enchanted River. I suggest bring your own recyclable/reusable eco-bag. I suggest that you wake up early in the morning to witness the magnificent sunrise in Hinatuan. After breakfast, ask your hostel host to radio a boatman to send you back to Talisay. Ask the local in Talisay to call for a Habal habal but don’t get frustrated as it will take a little while. From Talisay head back to Hinatuan terminal, usually you pay Php50.00 per head for the habal habal service, but if you are generous enough you can give a little tip to the driver.Remember you are there directly benefiting from the people's initiative by protecting the site, so a little generosity would be nice. You will know that you are in Salvacion when you see the board of La Entrada. At the waiting shed of Brgy. Salvacion, take a habal habal going to Britania, fare is Php 20.00 per head. Better ask your driver to pick you up before 2:00 pm . Proceed to LGU tour facilitator or to a private resort in the area. The tour costs Php1500.00 per banca. You also have the option to stay in one of the private resorts and accommodation in Britania if your time have become "compromised" along the way. After you finish your lunch in Buslon island, head back to the main land before 2pm. Go back to the highway through your hired single motorbike and wait for a bus or van bound for Butuan or you may do the cutting trip, take a van heading to San Franz , then bus bound for Butuan. In Butuan take a tricycle going to your choice of accommodation, there is the Red Palm, Prince Hotel, Windsoar, Hotel Caraga etc. In my case I always go for the cheapest option, so I am a regular patron of Garage/Julians Inn along Nangka road. It is a little bit far off from the highway(5 minutes walk) but at least it is safe and peaceful. The single non-airconditioned room is Php290.00 while the airconditioned room is Php390.00. Towel and other toiletries are not provided. Take your breakfast either in the restaurant of the hotel or proceed to Cuidad . Tricycle is rare in the morning so you will take a little walk back to the highway. After you had your meal you can now ride back to the airport. Take a multicab with a sign Bancasi, fare is P15.00. I just hope you are not late! Bon voyage and have a safe trip back home! Summary : Itinerary and Projected Budget for the Tri-Aqua Mindanao Adventure in Surigao del Sur. Thank you and I hope this will help you on your trip to Surigao del Sur. Yah very true, Mindanao has been unfairly tagged for the longest time as dangerous. Mindanao is composed of many provinces. Many of which are peaceful, and holds such awesome treasures. I've been to Surigao, Bukidnon, CDO, Davao, Zamboanga and had a blast each time. I guess as bloggers we can make it our mission to make people aware that Mindanao is not equal to 'danger zone'. pasencia na sa long comment, my father is from Mindanao and we have many relatives from there and so this issue is a bit close to my heart. Looking forward to your future articles on discovering the best of Mindanao! Very informative post! Thanks for sharing. Hopefully matuloy ako dto. We are planning to visit Surigao this year. Your very detailed guide will surely help us on our trip. Thanks for sharing! Very detailed post. This tri-aqua adventure must be really hard and confusing especially if you're from Manila. This will surely help us man, i appreciate your effort to help us! THANKS!!! Hi @Ish@Ish , we have our backpack with us all the time. When we visited Tinuy-an there are a few cottages where you can put your things while exploring the place. It's a safe place. Thank you so much! your blog post help me alot! Thanks!